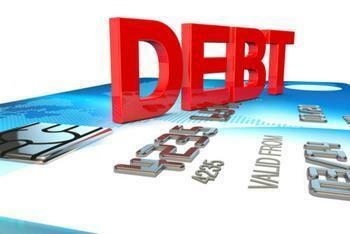 Numbers crunchers who follow consumer debt are growing increasingly concerned about rising levels of credit card debt. As we reported last week, personal finance site WalletHub recently sounded the alarm, reporting that consumers racked up a record $21.9 billion in new credit card debt in the third quarter alone, the largest increase since 2007. It predicts 2016 will end with a net increase of about $80 billion in credit card debt, with the average household owing more than $8,000. A new report from the personal finance site NerdWallet looks at total consumer debt, putting the total at $12.35 trillion. Credit card debt alone, it says, averages $16,061 per household. It's one thing to owe money on a mortgage – there is always a cost of putting a roof over your year and right now mortgage rates are low. But the report's authors note that credit card debt is expensive, with the average household with a credit card balance paying over $1,200 in interest each year. "Cost of living continues to outpace wage increases, contributing to increasing debt levels," said Sean McQuay, NerdWallet's credit and banking expert. But McQuay warns that consumers turning to credit cards just to meet monthly expenses are falling into an expensive debt trap. He says the average credit card interest rate is nearly 19%. "Paying down credit card debt will mean changing spending habits or increasing earning power, both of which may be difficult adjustments, but they are the only way to build financial freedom," he said. Consumers resorting to plastic to get through the month is not uncommon. Despite a low official inflation rate, McQuay says cost of living increases have risen faster than incomes over the last 13 years. Household income is up 28% since 2003, but medical costs have increased by 57% and food and beverage prices rose by 36% during that time. Meanwhile, a new report from Affirm may shed additional light on the increase in credit card debt. It finds that consumers are more concerned about uncertainty than they are about debt in general. In other words, if they feel confident in their ability to pay back the debt, they are more likely to take it on. However, it did find that 60% of consumers have some degree of worry about getting too deeply into debt. Of those who expressed concern about debt, 57% cited a fear of “getting in over their heads” as the main reason for that concern.